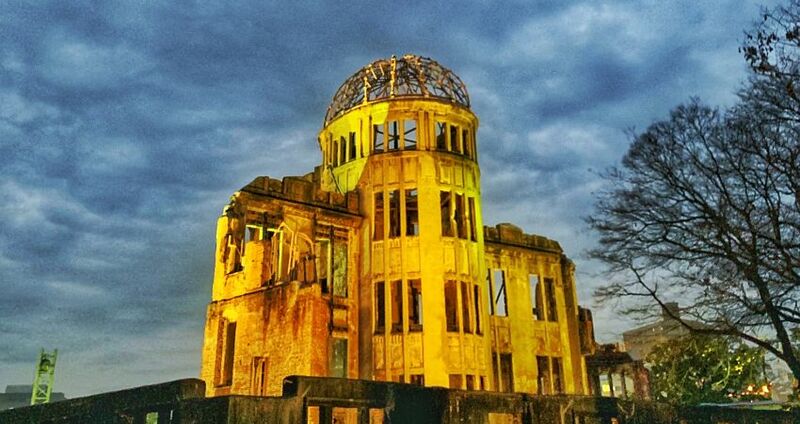 Hiroshima is infamous for being one of two cities targeted by the United States during World War II (the second being Nagasaki, another 300 km south west of Hiroshima). So it was important to make this stop on our 14-day tour outside of Tokyo. Both Shyla and I knew this would be an emotional, powerful, and exhausting portion of the trip. 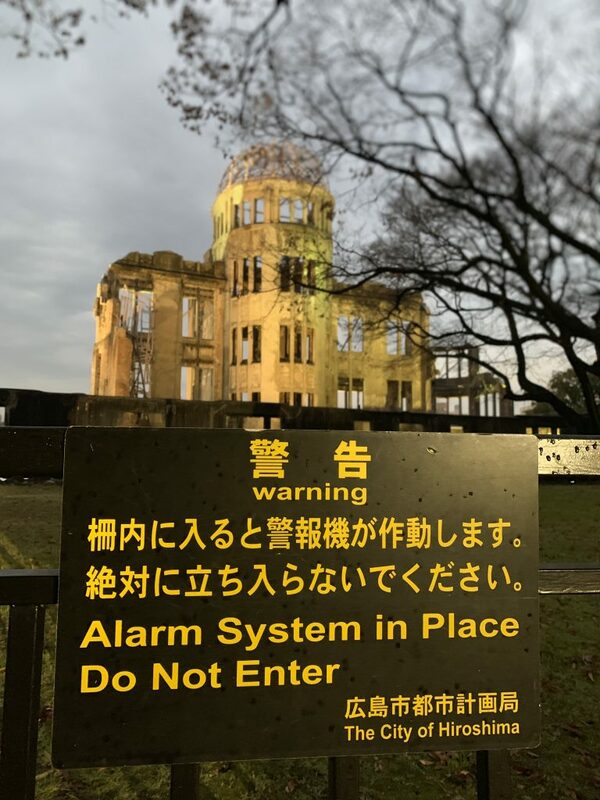 That isn’t to say we weren’t going to enjoy the city of Hiroshima, it just means we had some business to take care of first. Our first night in Hiroshima was pretty chill. We arrived around 6 pm and made our way to our hotel, the Hiroshima Washington Hotel. Before going any further, I want to point out the ridiculousness of this hotel name. Anyways, we got to the hotel and dropped off our stuff. We weren’t able to get any food before there Shinkansen from Kyoto, so we were both pretty hungry. 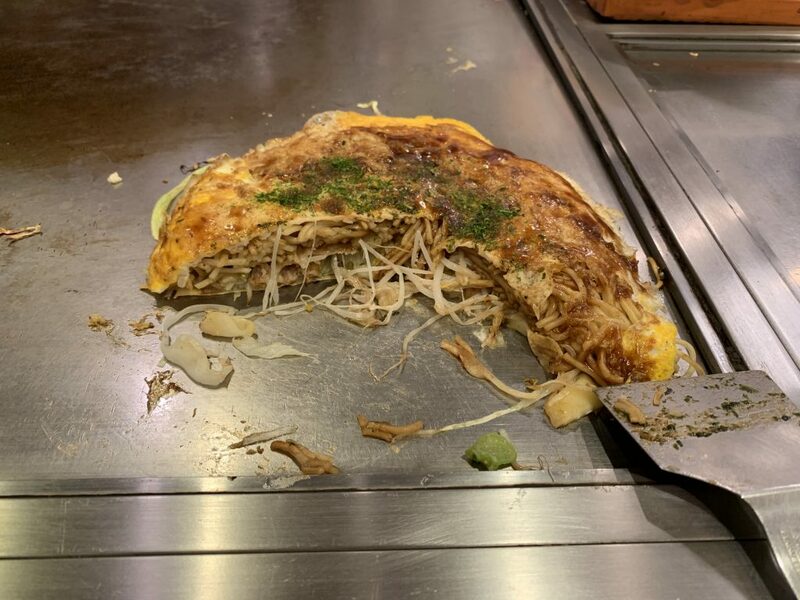 Good thing Okonomiyaki was on our list of foods to get in Hiroshima since it has a few varieties but the two varieties we wanted to try are Hiroshima style and Osaka style. Okonomiyaki according to the authoritative source Wikipedia is described as, “a Japanese savory pancake containing a variety of ingredients. The name is derived from the word okonomi, meaning “how you like” or “what you like”, and yaki meaning “cooked”. Okonomiyaki is mainly associated with the Kansai or Hiroshima areas of Japan but is widely available throughout the country. Toppings and batters tend to vary according to region. 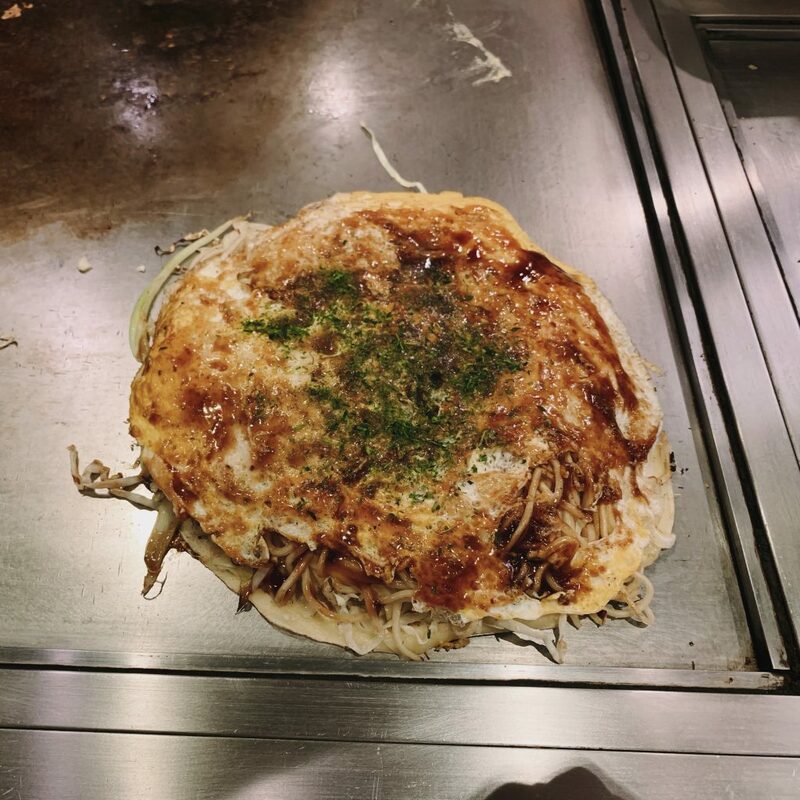 In Tokyo, there is a semi-liquid okonomiyaki called ‘monjayaki’” (source). My Okonomiyaki was the baseline standard for the dish. Nothing special just your basic Okonomiyaki I wanted to know what an original tasted like in Japan before getting “freaky” with other variations. We sought out an Okonomiyaki vendor that had vegetarian options for Shyla, who had the Mochi variant! They were delicious. The “diner” itself was really cool. I call it a diner but it’s really a 4-floor building filled with small Okonomiyaki vendors. As you walk around the floors looking at their posted menus, they offer you seats and try and get you to eat at their location. They aren’t pushy but it can be awkward passing empty stalls looking for the right place to eat. Okonomiyaki Is served on the surface it was cooked on. This was my “basic” Okonomiyaki. Okonomiyaki is served on the surface that they cook it on (on reduced heat). You use a small spatula to cut it up and place it on your plate. This was the 4-floor Okonomiyaki diner we went to right behind our hotel. Afterward, we walked around the area a bit, got some snacks, and called it a night. 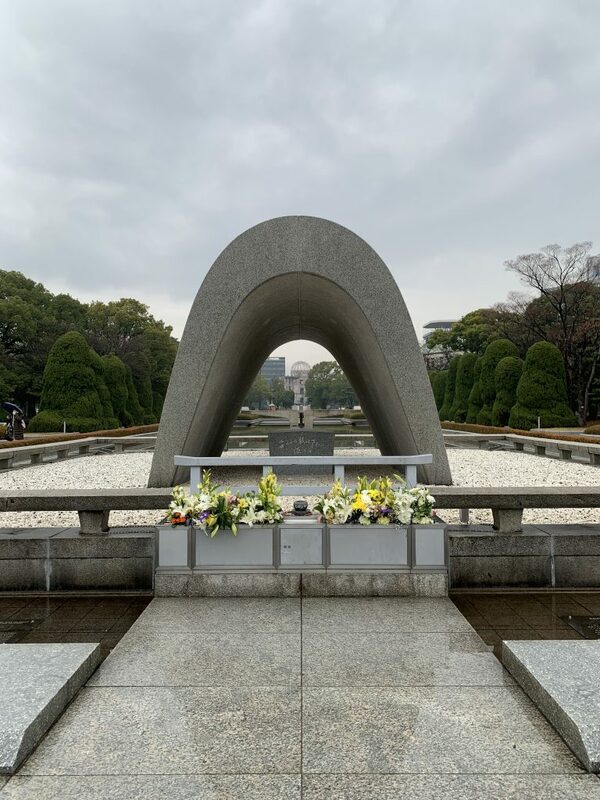 Out first day in Hiroshima was going to be the most difficult since we were planning to visit a bunch of atomic bomb museums, visit the peace park, and the atomic bomb dome. The weather was slightly raining so we picked up an umbrella from the dollar store near our house. These umbrellas are surprisingly well built considering it was from the dollar store. However, we were able to follow a pathway through a covered outdoor mall almost the whole way to the park (these seem popular in Japan). 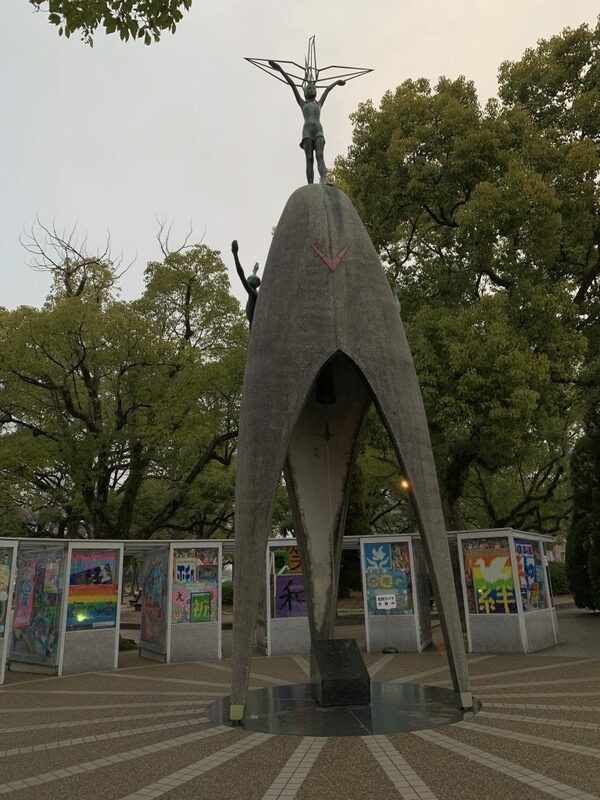 Once in the peace park, you start to see statues, plaques and memorials about the atomic bomb blast that devastated the city. 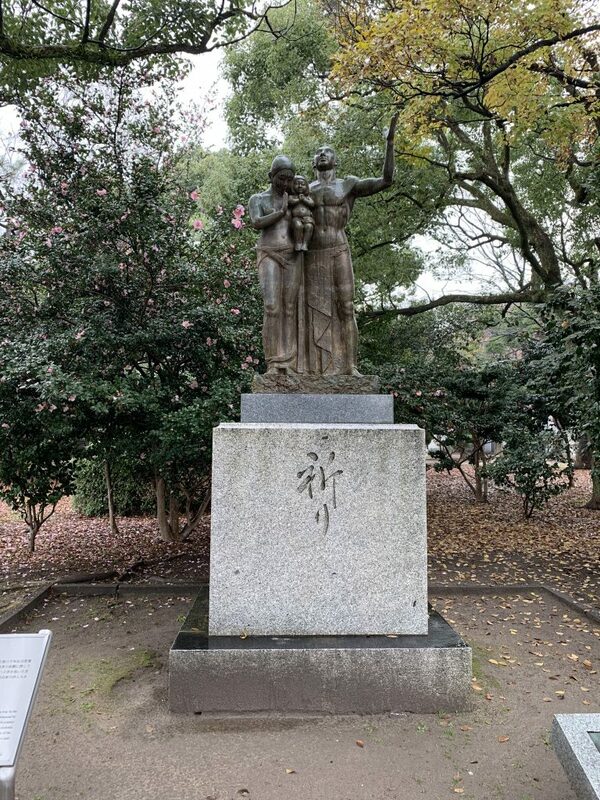 Statue in Peace Park, Hiroshima depicting a man, woman, and child. It is called the “Monument of Prayer”. 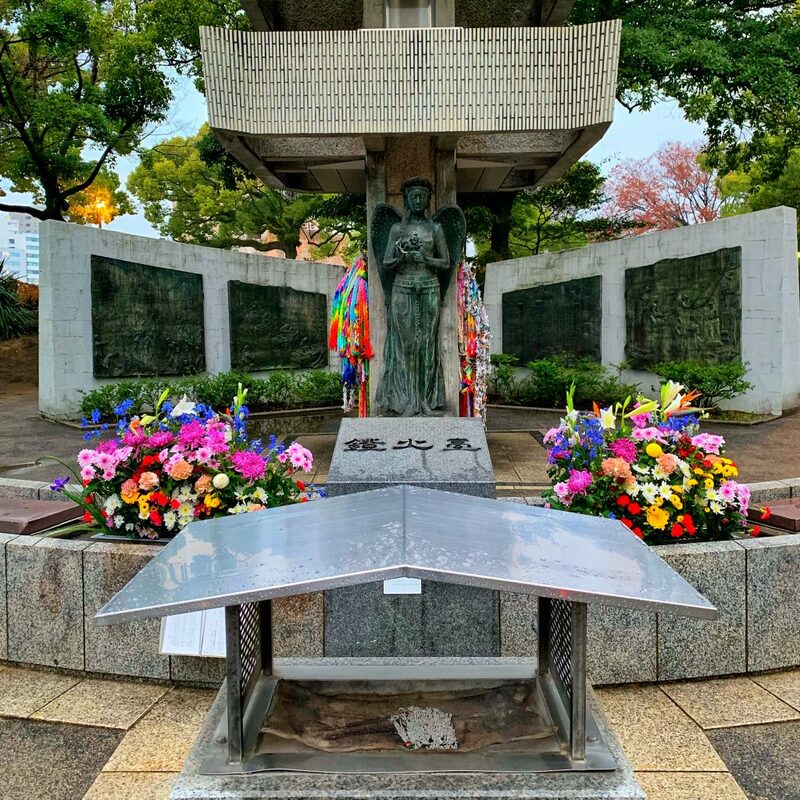 This memorial is called the “Memorial Monument for Hiroshima, City of Peace”. Notice the alignment of the memorial. Through the center you can see a small flame and beyond that the atomic bomb dome. The park was basically ground zero for the atomic bomb blast. We actually walked across the bridge that the United States chose as the target point for the bomb drop, it was seriously a very powerful place to walk around. 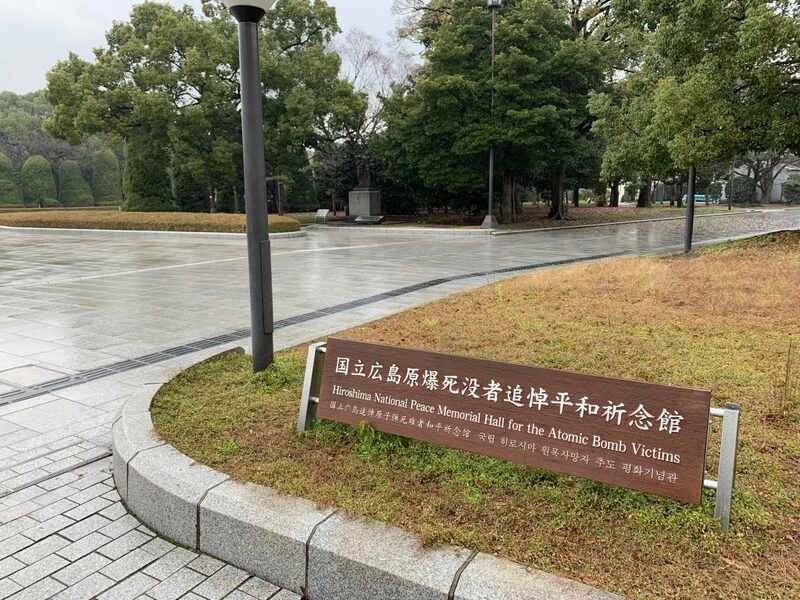 Once we walked around the park a bit we entered the Hiroshima National Peace Memorial Hall for the Atomic Bomb Victims. Sign for the Hiroshima National Peace Memorial Hall for the Atomic Bomb Victims. This small ‘museum’ was absolutely brilliant. You walk down a circular path to an open room. In the center, a fountain in the shape of a clock face reading the time of 8:15, the time the bomb detonated over the city. Around the edge, a 360 degree, tile mural of the destruction caused by the atomic bomb blast. Each tile, representing one of the 140,000 people killed in the blast. Photos were not allowed in this museum, so I cannot embed images but here is one photo on the internet showing the room. You can google “Hiroshima National Peace Memorial Hall for the Atomic Bomb Victims” and see more photos of the room. 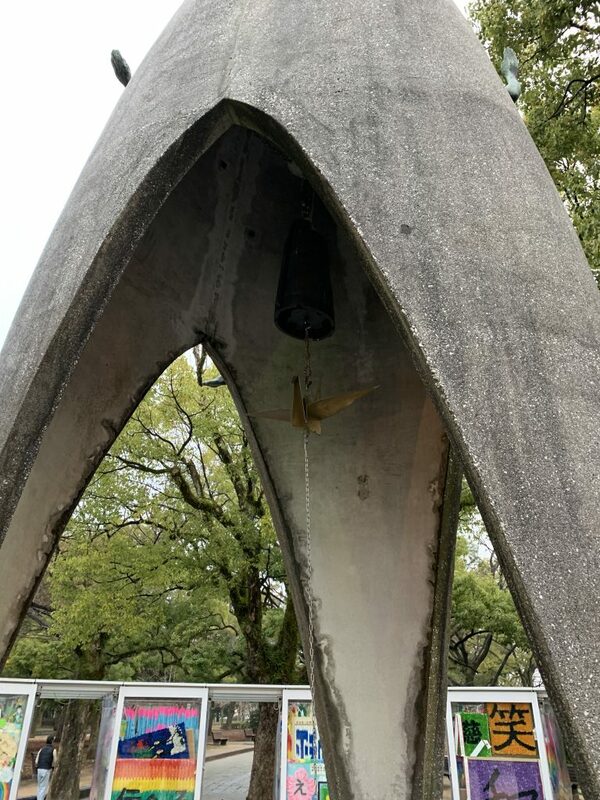 This is the above portion of the Hiroshima National Peace Memorial Hall for the Atomic Bomb Victims, you go down underground to enter the hall. Next, we visited the Hiroshima Peace Memorial Museum. It isn’t the biggest museum I’ve ever visited but I’ll admit, it was one of the most emotionally taxing on me, both emotionally and physically. I left the museum angry, sad, and tired. 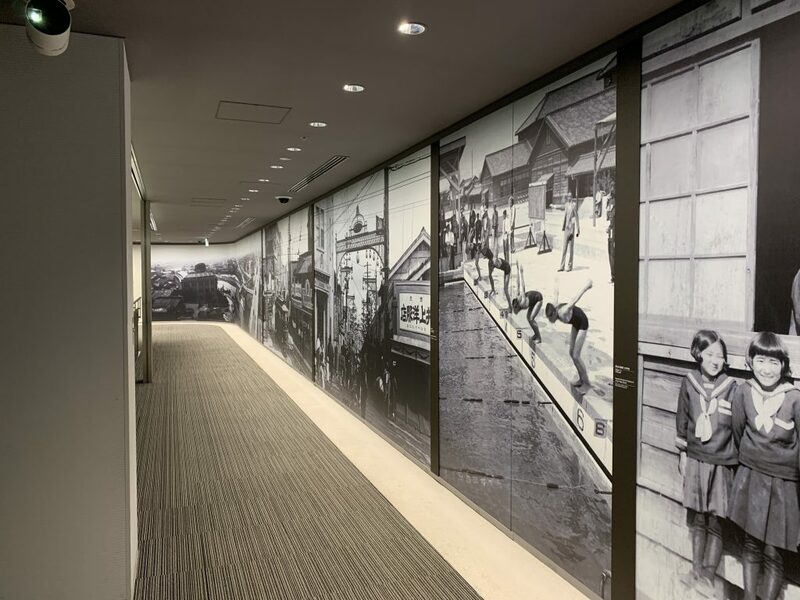 Hallway entrance to the Hiroshima Peace Memorial Museum. First exhibit room in the Hiroshima Peace Memorial Museum. I avoided taking too many photos here since I just wanted to soak in the experience. I will post a few of the photos I did take in the museum though, as those had the biggest impact on me. I also didn’t want to take photos of the clothing they had on display. I didn’t want to show that. Seeing that was an experience between me and the memory of the victim. I did, however, take one photo of a child’s uniform just to show what the museum had in its collection. 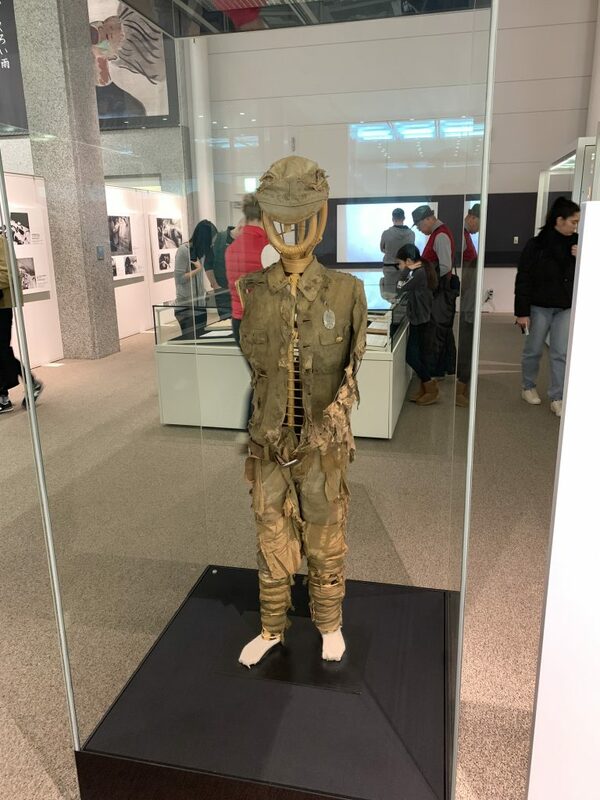 Child’s uniform from the day of the atomic bomb attack. One of my favourite displays was the one showcasing President Barack Obama’s visit to Hiroshima. This gave me hope that the United States can elect someone for president with an emotional intelligence of something higher than a one-celled organism. This can’t be said for their current President, Donkey J. Trump. 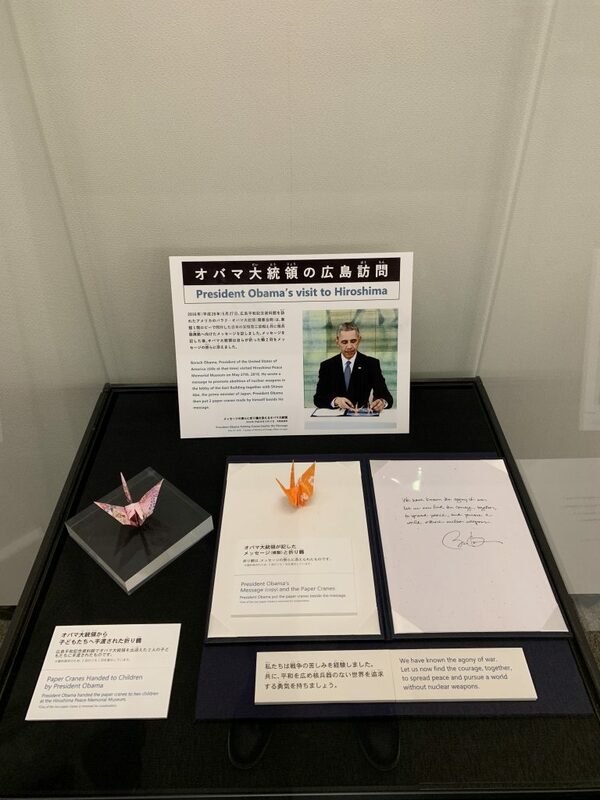 Display of President Barack Obama’s visit to Hiroshima. 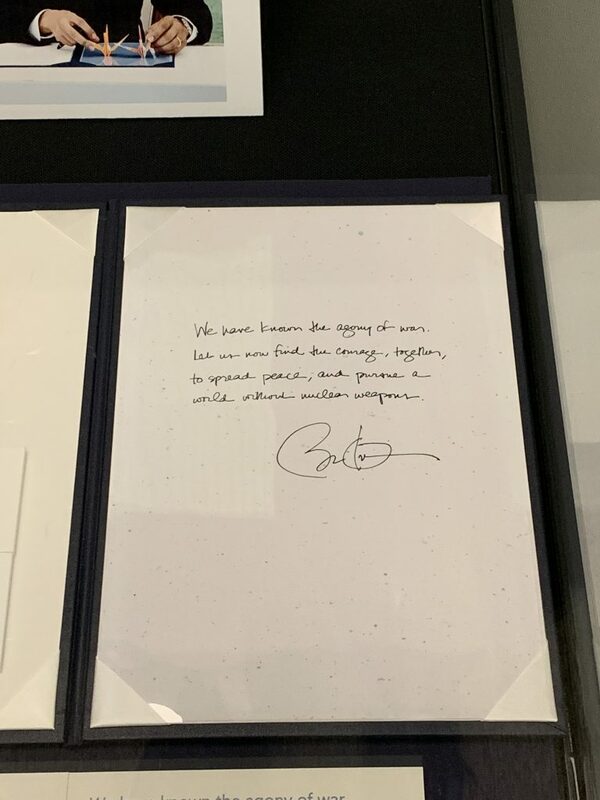 This simple and elegant message from President Obama. 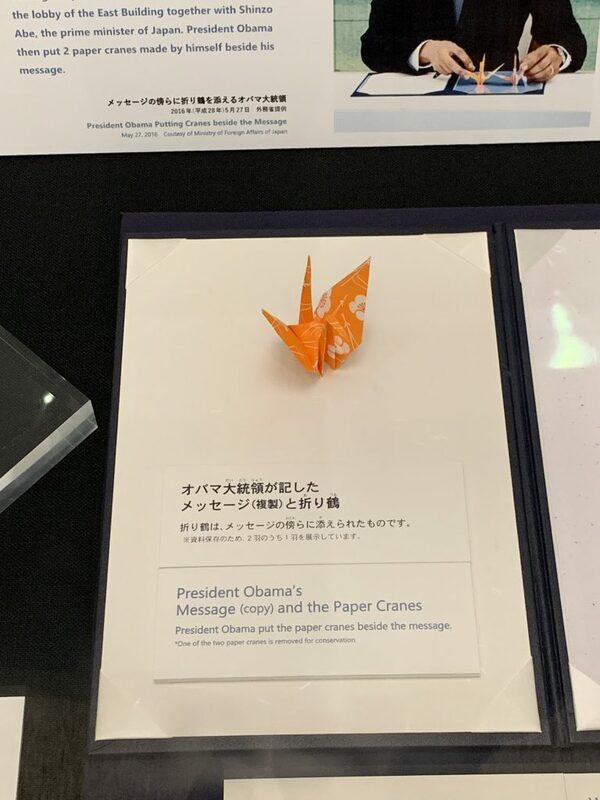 The paper crane President Obama places beside his message. 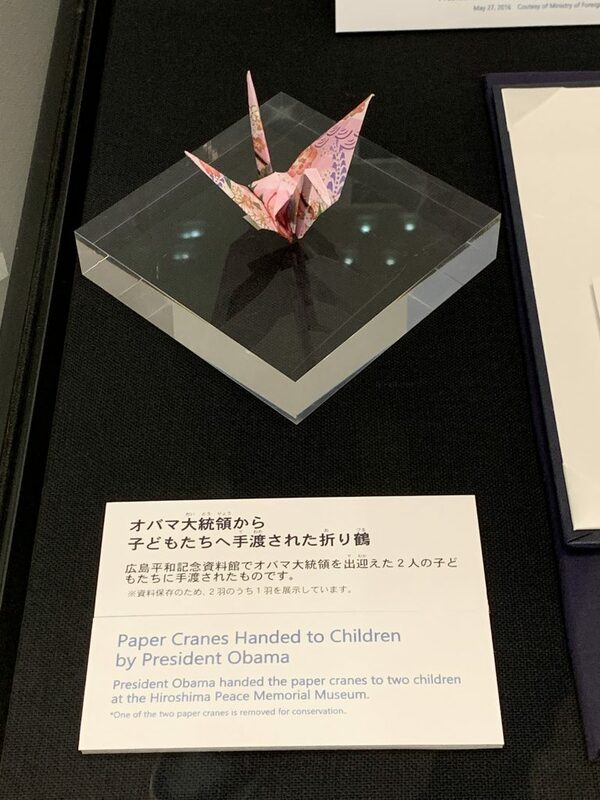 Paper cranes handed out to children by President Obama. We left the museum near closing time. It was still raining, it was getting dark and I was depressed. 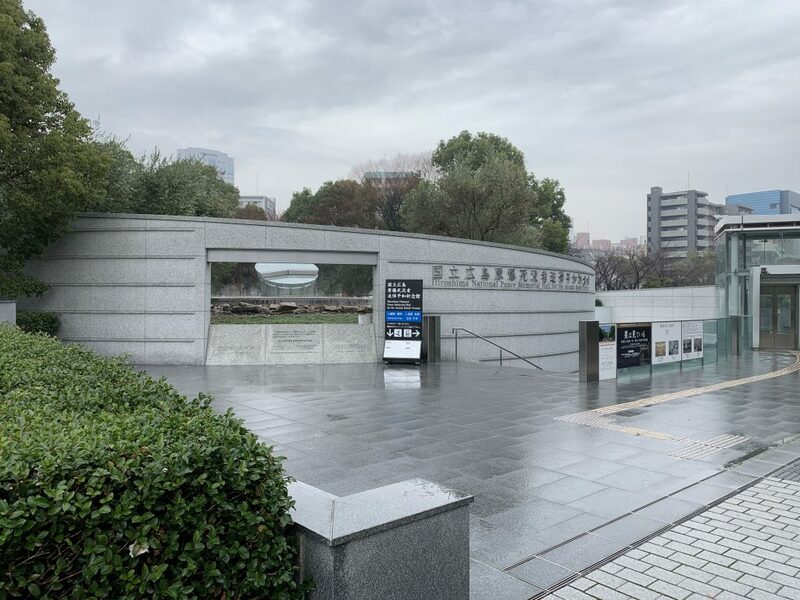 I do recommend visitors coming to Hiroshima to see these museums, just understand that you may feel enlightened, but you won’t be in the greatest spirits after leaving. We walked over to the Atomic Bomb Dome, a building that was preserved that still stands after the atomic bomb explosion in 1945. On the way over we passed two memorials, one dedicated to the children who lost their lives in the bombing. The Children’s Memorial in Peace Park. Children’s Memorial, notice the paper crane underneath with a ringable bell. The dome was haunting and beautiful at the same time. When I approached it, I felt that is was very creepy. The windows are without glass and open up into a destroyed building. That said, the longer you stand and look at the building, the more interesting it becomes. It is clear that the building was preserved to ensure that nuclear weapons are never used again. The pure destruction of the atomic bomb is preserved in this building. I took so many pictures, here are just a few samples. 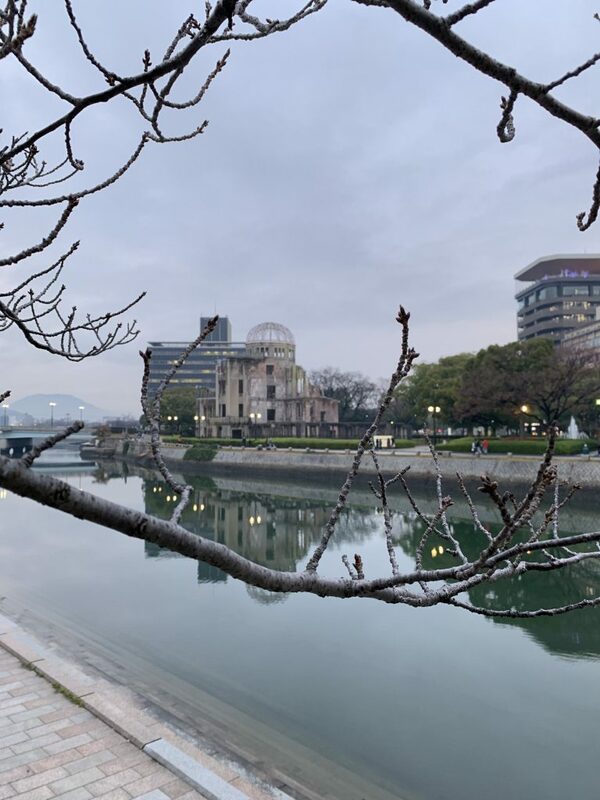 The Atomic Bomb Dome, photo taken from the bridge coming from Peace Park. The Atomic Bomb Dome up close. This photo shows the inside of the Atomic Bomb Dome. 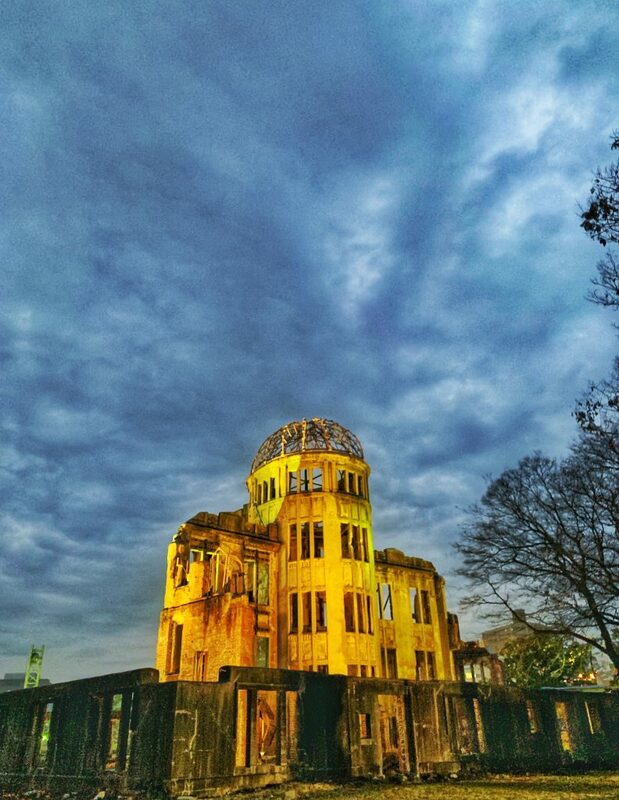 The Atomic Bomb Dome is beautifully lit at night. Signs warning visitors not to enter. 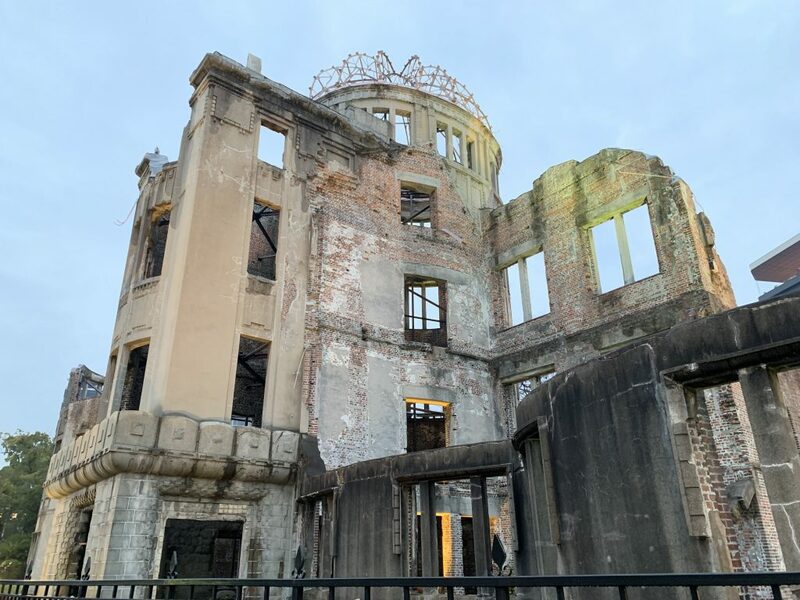 After the museums and Atomic Bomb Dome, Shyla and I had to decompress, so we walked around the city of Hiroshima for a bit and got some dinner. To cheer up we went to the Hiroshima Pokémon Centre. They are decorated for Christmas! 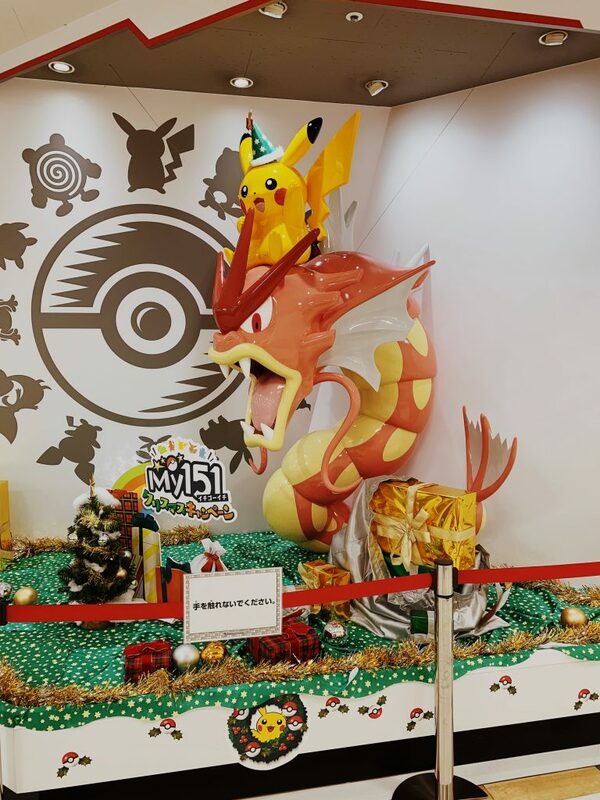 Pikachu is wearing a Christmas hat!!! After our emotional first full day in Hiroshima, I was looking forward to something a little more ‘fun’. 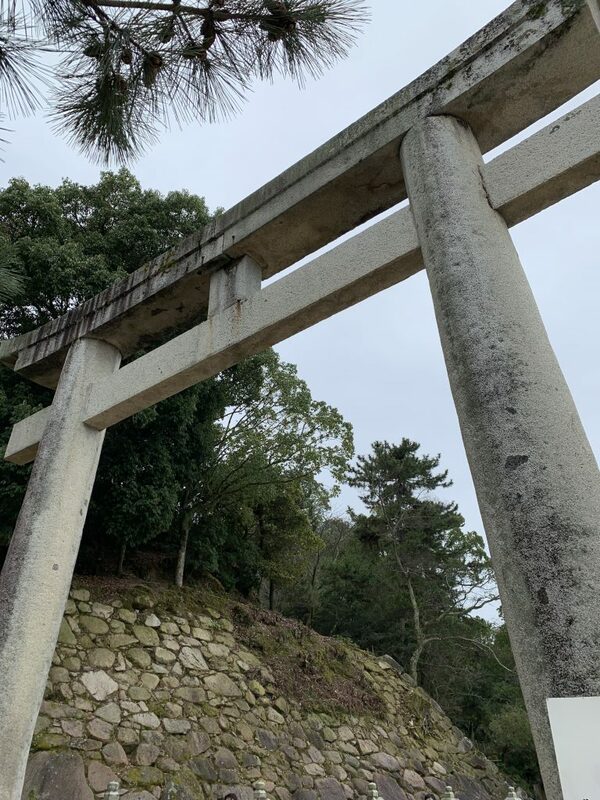 On day 2 we planned to visit the island of Miyajima and the water shrine Itsukushima! 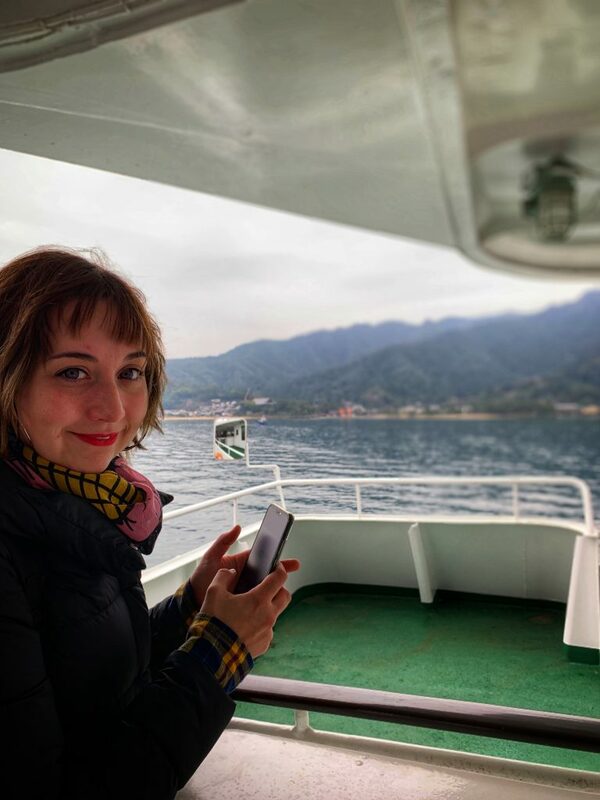 We took the train from Hiroshima to the ferry that would take us to Miyajima. Apparently, Shyla is afraid of boats? Open water? Drowning? All the above? Take your pick… but apparently, her love for the local inhabitants ***cough*** deer ***cough*** is worth it. It only took about 10 minutes to cross from the mainland to the island but we saw some absolutely stunning views of the island! The view from the ferry ride over to the island. Frizzy haired Shyla taking photos from the ferry. Once we got there, Shyla lost her mind over the deer. They were okay… some were real jerks to the tourists. For example, one mauled a woman for her food. 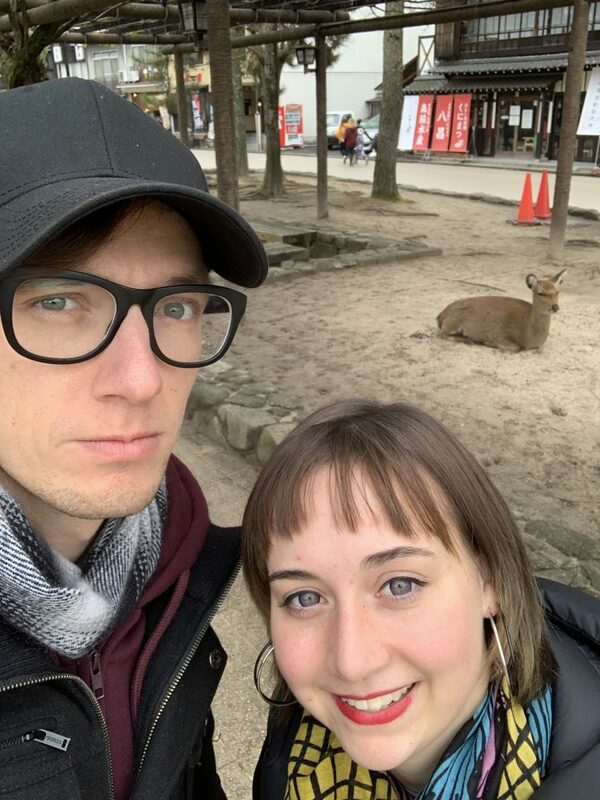 Shyla, impressed with deer… Ryan, less so. The Itsukushima Shrine was a short walk from the ferry so we started to walk over towards it. This walk offered us a number of opportunities to grab some great photos of the shrine! 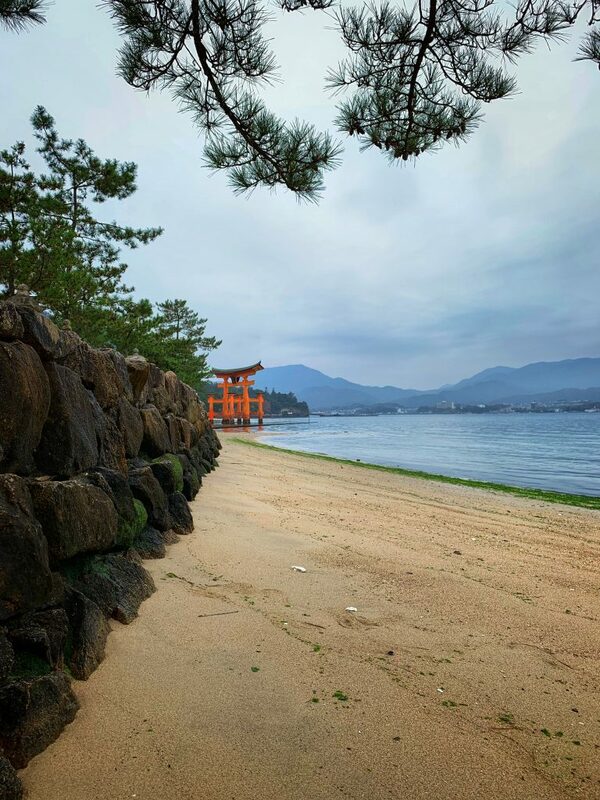 Itsukushima Shrine from the beach. The shrine itself is out in the water but the tide recedes around noon, allowing eager tourists the opportunity to run out touch the shrine and take countless selfies with it, which is what we did too! 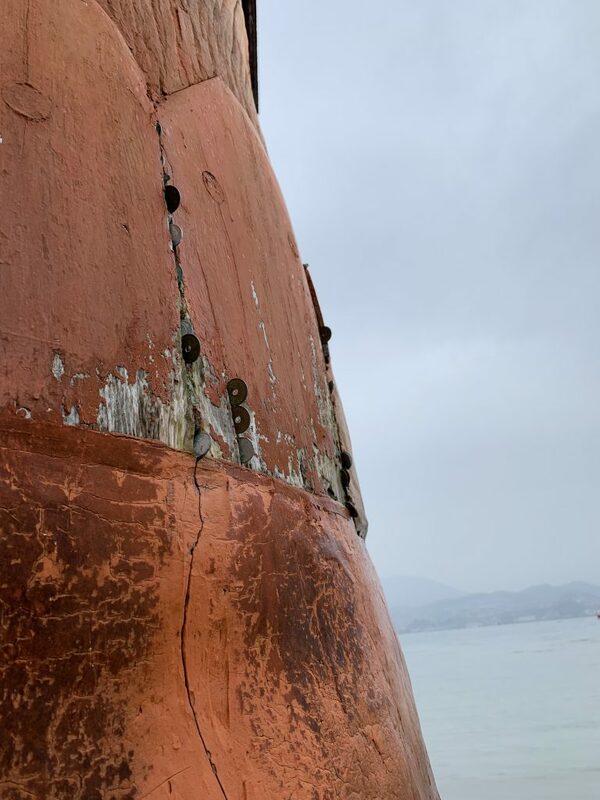 The water around Itsukushima Shrine is still in the bay. Coins litter the water bed. Once the tide went out, we were able to get right up beside the shrine. From a distance, you cannot see the details that make this shrine really unique. 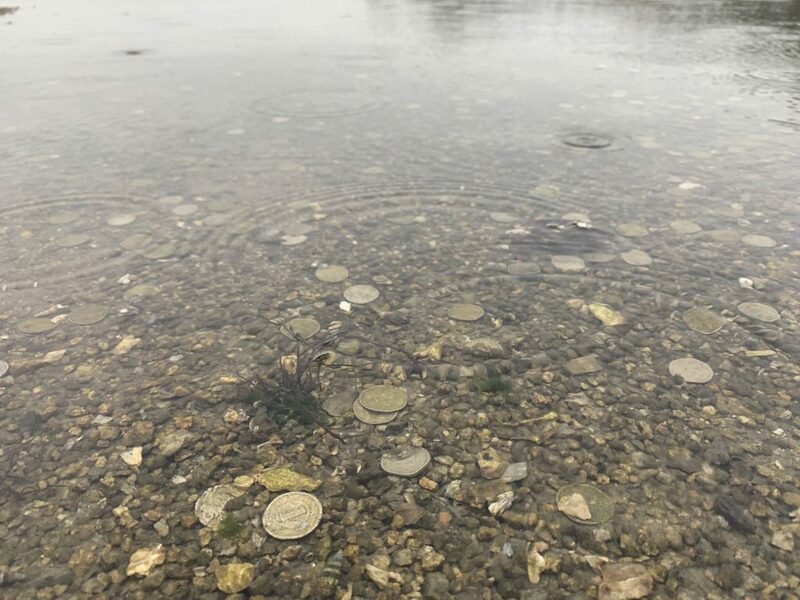 When you get close, you can see coins all over the water bed. Not only that, but some of the coins are lodged in the shrine itself! 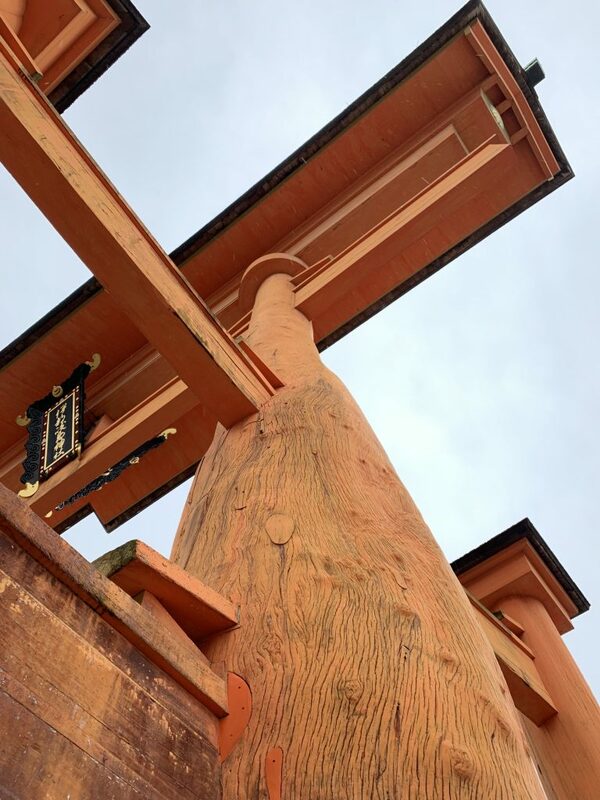 The other interesting thing I noticed when getting close is that the columns that make up the shrine are not perfectly cylindrical. You can tell they are huge tree trunks! Coins are lodged in the shrine. Up close you can see the detail of the tree trunk. After we were done at Itsukushima Shrine, Shyla and I climbed Mount Misen. 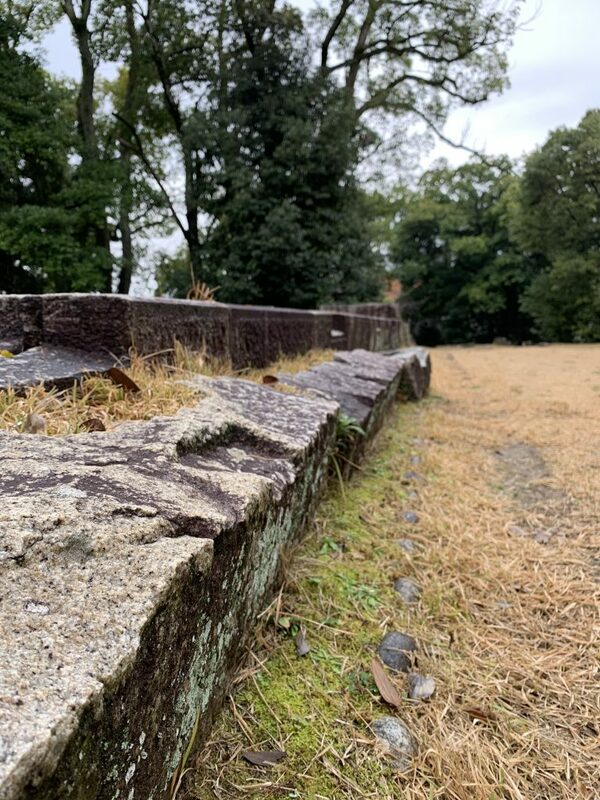 If you’ve been following the adventure so far, you’ll have seen the post I made a few days ago titled, A Tale of Two Hikers. I won’t go into detail about the hike here, so go check out that blog post for an in depth “tale” about our hiking adventure. 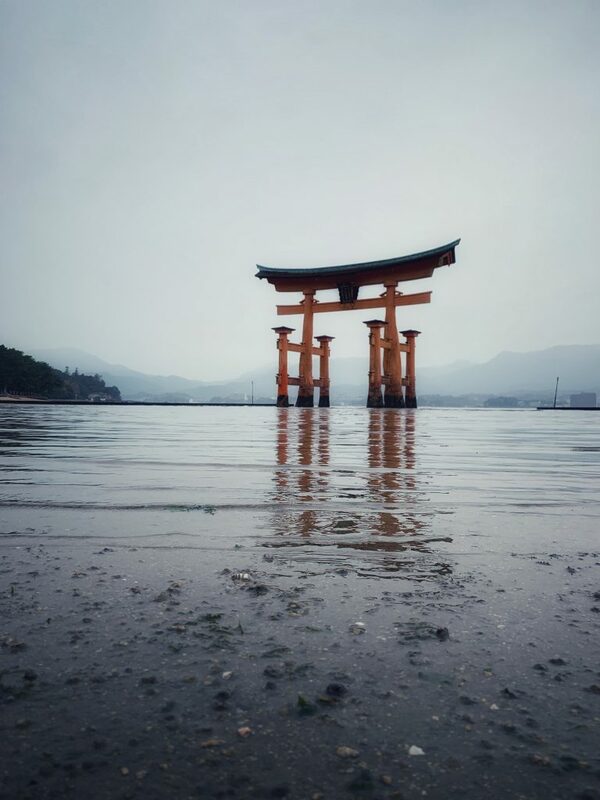 Overall, Itsukushima Shrine and Miyajima were absolutely stunning to witness with my own eyes. To see more pictures of this part of our trip, the album can be found here. 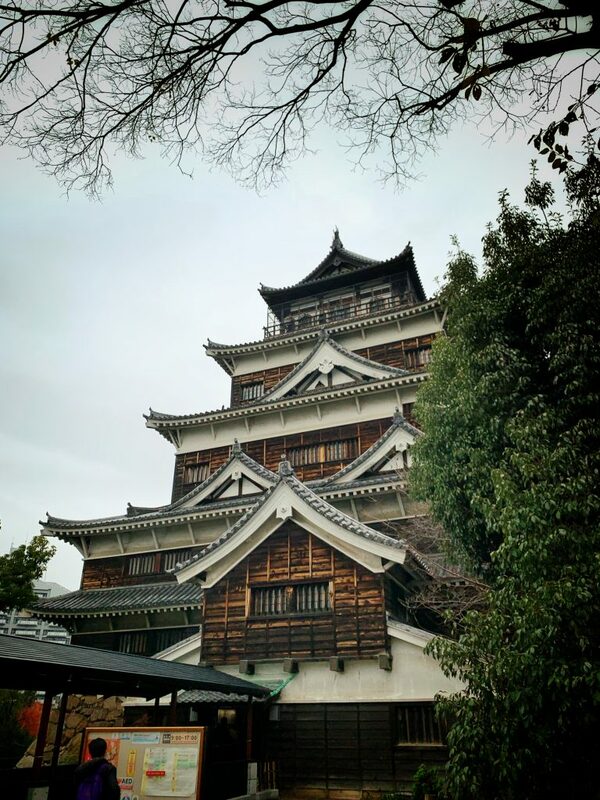 Our final day in Hiroshima was spent visiting a castle! Hiroshima Castle to be exact! I was running on quite literally zero hours of sleep. I spent the previous night writing the last blog post while it was still fresh in my mind. If you don’t force yourself to sit down and write, you’ll never do it all. I’m looking at you Shyla! As we walked to the castle, I realized that what we were going to see was a recreated castle. The original would have obviously been destroyed in the atomic bomb blast in 1945. What was interesting, however, was seeing the buildings that are no longer there but their foundations survived the blast. 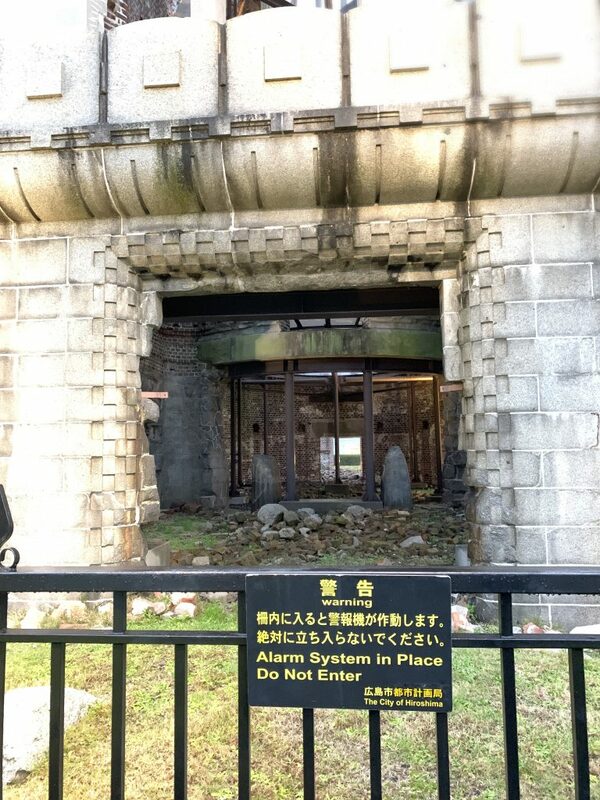 The ruined foundation of a building that stood before the atomic bomb fell in the 1945. More interesting than seeing the foundations of buildings that survived the blast, was seeing the trees that managed to survive the blast. 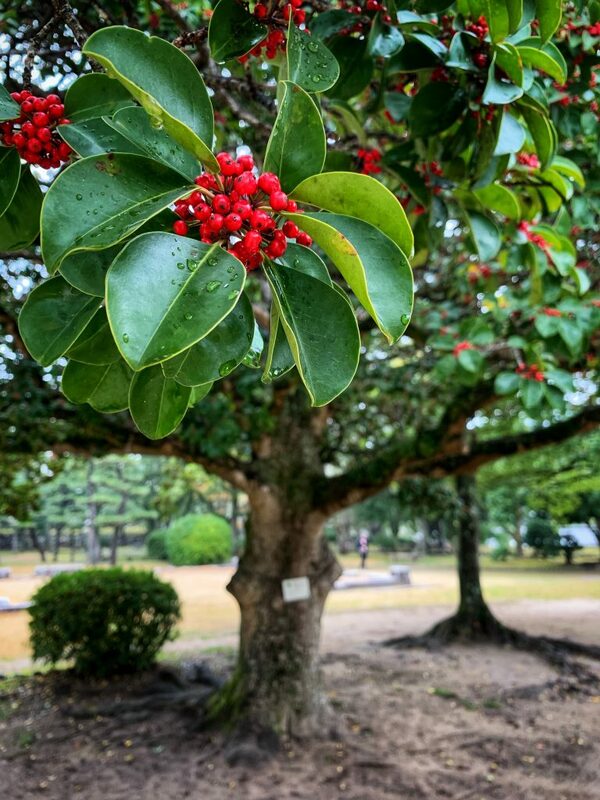 There were several trees on the Hiroshima Castle grounds that had plaques indicating that they had survived the explosion and their distance from the hypocenter. This tree survived the blast and was 910 meters from the explosions hypocenter. I love how it’s still flowering over 70 years later. 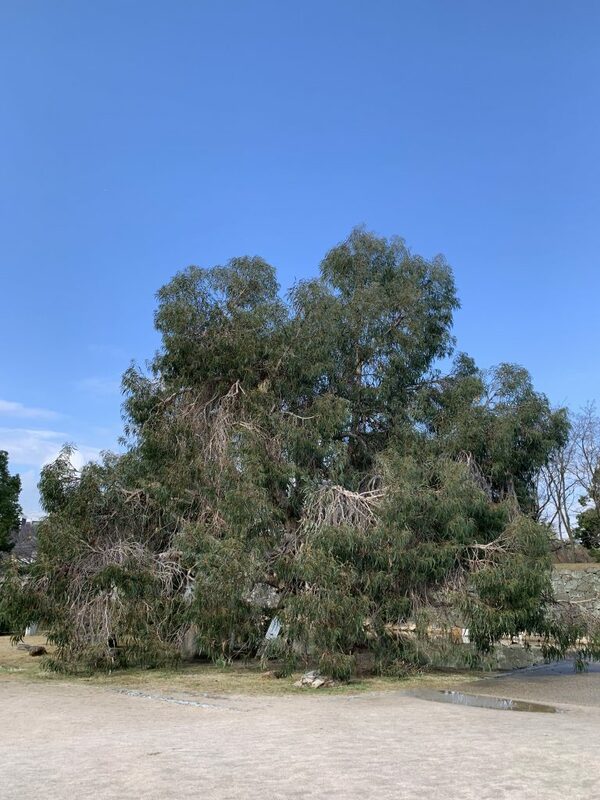 Eucalyptus tree that survived the atomic bomb. It was a staggering 740 meters from the explosion. 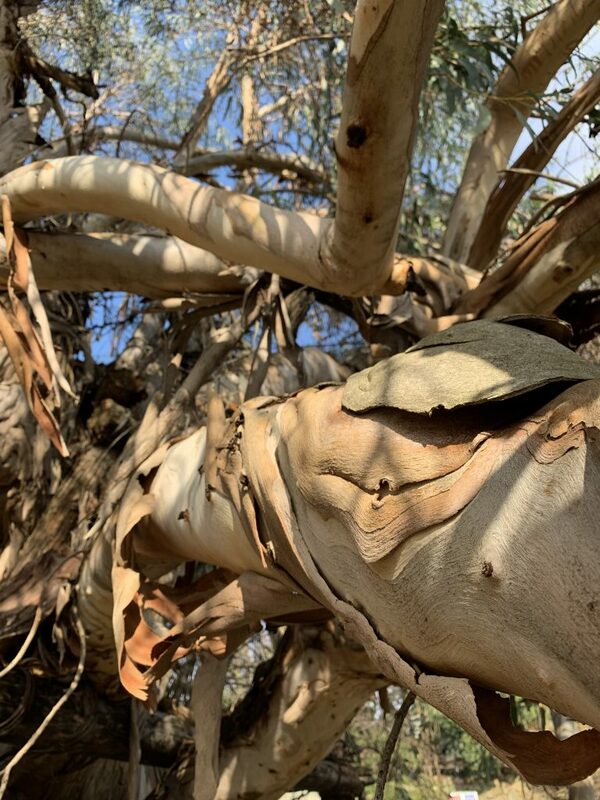 The twisted branches of this eucalyptus tree were a sight to see. The bark is peeling from the branch now. 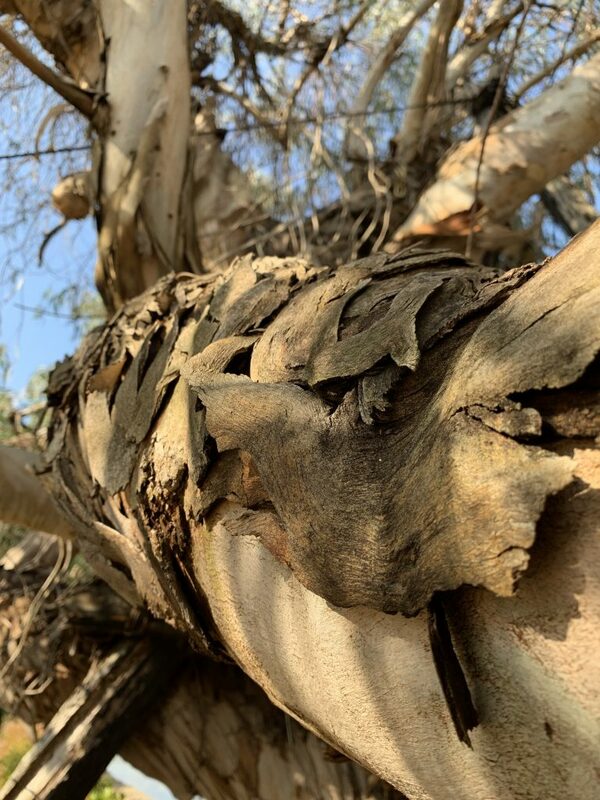 Another shot of the bark peeling from this eucalyptus tree branch. Nature is so resilient. To see these trees doing so well after more than 70 years is inspiring. They survived while almost all man-made structures were destroyed. 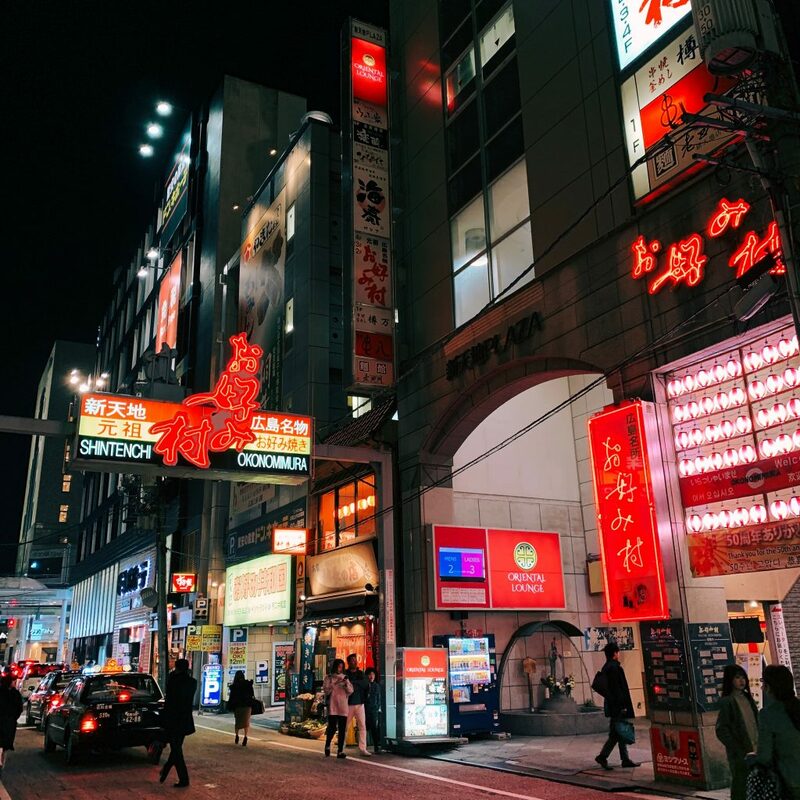 Our next stop is Osaka! 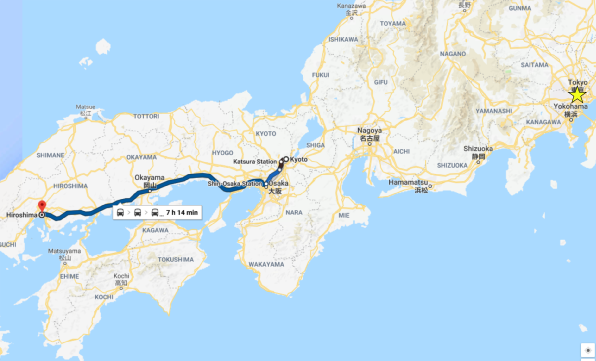 This is where we will be spending Christmas before heading to Fukui. I’ll try and post some more pictures shortly! In the meantime, enjoy this photo from last night when we were strolling around. 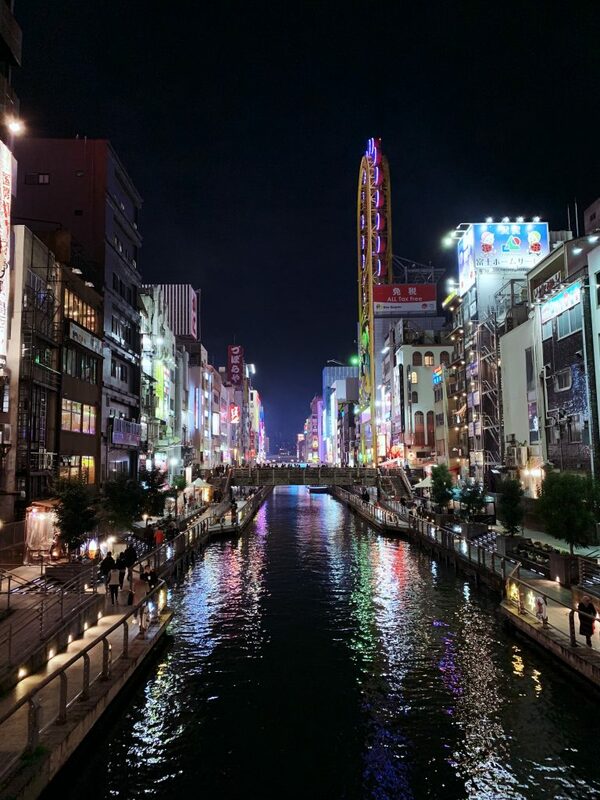 Beautiful Osaka at night, reflected in the calm river.